By adding the technology of graduated compression, this sports sock gives you the added benefit of improved circulation while performing any sport or leisure activity. You will notice your legs feel better at the end of any activity. Made with Cool-Max, a fiber that pulls moisture from the skin to be absorbed to the outside of the sock. It is thicker than a standard nylon/lycra sock (about the thickness of a standard athletic sock), with additional thickness around the entire foot area, giving a new level of comfort in a support sock. Ideal for athletics, walking shoes, golf and any casual or sporting activity. New 2x size is designed for individuals over 220 lbs. Mojo Compression delivers physician-prescribed elastic compression therapy guaranteed. These are exactly what I needed. I have swelling of the ankles after surgery a couple of years ago. I am also a hard fit due to my height and calf size. These have just the right amount of compression, are nicely cushioned in the foot, and are not tall enough to constrict my calves. I will be ordering these again. I am glad I ordered both white and black. These compression socks are soft and comfy as well as useful in providing compression for a chronic (but not life threatening) swollen ankle. And, since I am petite, the crew length size are knee length for me, and I don't have to fold them down at the top! Love these for times when I am wearing shorts (which is most of the year in Houston). Very light compared to other competing products, but very supportive. Because of these, I have started buying other Mojo branded products. Really happy with them. I recently broke my hip which is healing well. I bought these compression ankle socks at the recommendation of my surgeon. I am very pleased with them, wearing them to exercise and for walks with my dog!! these are fairly thick which i like and long enough on the calf. the foot part was too large. i ordered for an xlg for wide calfs as i swell in the lower legs. these were marginally larger than the regular compression socks i have. they still cut in deeply on upper calf so i have to roll them down to the lower half to reduce any swelling. if you are slightly above regular in the calf probably would do very well. I never realized there was so much variation in compression between brands labeled as 15-20 mmHg. These are one of the few that do the job and come in a color besides white. Per other reviewers, I ordered a medium instead of a Small and, after washing, they fit perfectly. The downside is they wear rather quickly in the heel and back of ankle area. They also shed in the wash like crazy when being washed with any other color fabric that their fuzz might stick to. However, they're inexpensive enough that it's not a very big deal, and I just wash them separately. 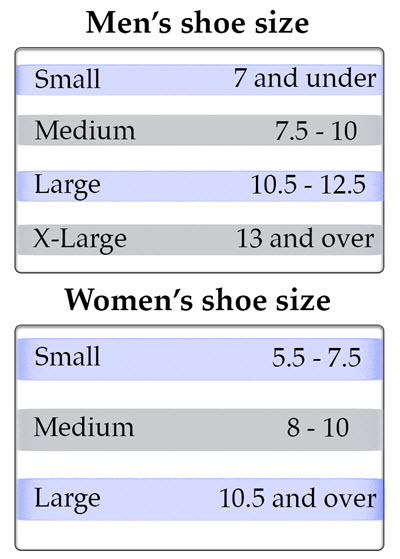 I'm always surprised at how the same pressure (15-20 mmHg) varies in different sock brands. I have a hard time finding crew socks in anything other than white that give the compression advertised. Well, these are it. I followed the recommendation to size up and, after washing, they're perfect! Very comfortable and again, very good compression. The only downside is having to wash them separately (they're black) because, the first time, when I included them with other laundry where softener can't be used, everything came out loaded with black fuzz. Other than having to wash them separately, I'm a happy customer. These socks do what I need. When I first received them I could only ware them every other day as the hold my feet in more a normal condition (strange for my feet). After a few days everything is really good even my toes are straightening out. I was a little surprised to see a slight tear appear on my left foot large toe. This is after wearing them 3 times with total mileage of 18 miles. Thought the wear would not show up before 50 miles.